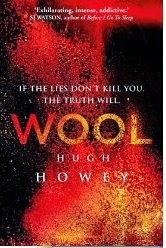 I'm not sure why the author chose the title Wool (pull the wool over your eyes? ), but this post-apocalyptic novel was originally written as a series of stories, then united seamlessly into this single volume. After some apocalyptic event, survivors live in a silo, hundreds of floors buried deep into the earth. The world outside is toxic and on the upper floors there is a view into the devastation of the world that remains. Inside the silo, humanity operates in a contained world that has been engineered to support them indefinitely. None of those living have any first-hand experience of the world "before." Three generations have lived and died in the silo--it is the only world they have known. The next chapters deal with the aging mayor and the deputy sheriff. These chapters introduce Juliette, who will become the dominant protagonist throughout the rest of the book. Juliette is a strong, independent woman who loves her job as a mechanic. She is a natural, if reluctant leader, and a fiercely loyal friend. Howey has created an interesting world in the silo. The society functions according to rules laid down by the creators of the silo, and it is a rare occasion when anyone questions anything about the the world in which they live--the silo society or its origins. The characters are well-developed and complex. The plot evolves slowly, organically and has some drastic differences from a lot of dystopian literature: there are no zombies or mutated creatures that threaten, and the society functions efficiently, if in a stultifying atmosphere. Reviewing Wool is difficult without spoilers, but the plot gradually unfolds and intensifies. From the first chapters, there is a sense of foreboding that hovers and keeps you on edge. Howey does a fine job with this dystopian novel. Dystopian. 2012. Print length: 550 pages. Wendy - Most novels that I've read in the genre have an outside threat--other humans, savages, mutants,or zombies that provide the sense of danger. And I've definitely read some exciting ones. This novel gave me much more of an eery sense of foreboding, of not knowing exactly what the threat was. I just finished another dystopian novel that I liked...Station Eleven. Oh, well, knowing how fond you are of The Walking Dead...maybe zombies! I've read so many raving reviews about this series that it's hard to ignore them. Plus, I like reading post-apocalyptic fictional. ;) I'm glad this doesn't have zombies; I just can't understand why I dislike reading about them. Strangely, I don't mind reading about vampires though. Melody - I'd never heard of this title before, although it seems everyone else has. It was offered free through Kindle Unlimited--I'm trying the free month of this service. Got lucky with this one! This is an interesting premise. The fact that you were impressed with the character development is a strong selling point. I would think this kind of novel would need to be strongly character driven to really work. Irene - This guy sold condos in a missile silo, but it isn't as huge as the ones described in the book. They were more like sky scrapers underground with 100's of stories. I have heard really good things about this book. I'm not usually a fan of novels that start life as short stories, but you and a couple of other bloggers have gotten me really intrigued for this! Jenny - So many people are familiar with this book, and I'd never heard either the book or the author. I'm glad I found it!